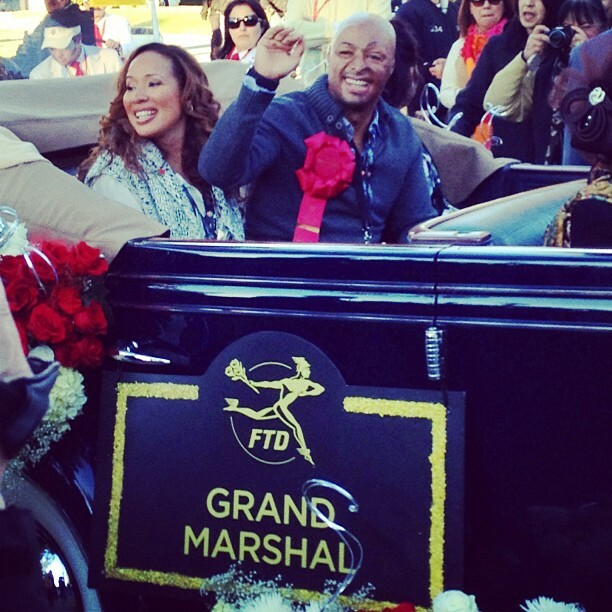 If you didn’t get to see J.R. in the parade, you can do so at KTLA. You can also view a recent parade preview with J.R. where he talks some on Dancing With The Stars here. Below is a clip of J.R talking about the honor of being Grand Marshal from CBS Los Angeles. Thanks to Jazortega for the picture above!! In case you missed Part 2 of Nancy Grace’s “Dancing Special” last night on her show, here it is in full special thanks to Grinya’s Entertainment. What do you think? I thought Part 2 was better than Part 1. I loved how they spotlighted the little dancers! They were so good. I loved how they included the full cast of this past season in it in some way, not just the dancers present at Dance With Me Studios with Nancy! I also loved Val playing his violin (and the retrospective with Mark Ballas) and the kiss on Nancy’s cheek from Maks after they danced (they would have made a cool couple to watch last season like he and Kirstie). Great show!! And again, if you missed Part 1, be sure to see it here. Great shows!! I hope Nancy will continue to cover Dancing With The Stars in the future. I’d love to see more TV coverage of what goes on at Dance With Me Studio’s as well. Fascinating!! Just a couple of reminders! Don’t forget to watch the Nancy Grace Show on the HLN network at 8:00pm ET for Part 2 of her “Dancing Special” tonight. If you missed Part 1, be sure to see it here. It was a gas and I’m betting tonight will be too! If nothing else, it’s great for those suffering from DWTS withdrawals. 😯 Nancy tweeted that the show will have “Child dance phenoms” as well…. Also, Dancing With The Stars Champ J.R. Martinez is the Grand Marshal of the 123rd Tournament Of Roses Parade in Pasadena, CA. If interested, you’ll be able to watch the parade go down LIVE on ABC and NBC at 11:00am ET on Monday, January 2nd. If you’d like to watch it commercial free and in 3D, you’ll be able to view it on the HGTV channel at the same time. In the meantime, TV Guide has a little interview with J.R. where he talks on the honor of doing it and why (his answer might shock you. lol). He also mentions Dancing With The Stars and his future plans in acting. On a future note and if you live or would like to travel to New York, Mark Ballas is giving a one night concert at The Landmark on Main Street in Port Washington, NY on January 27th at 8:00pm. You can read more about the concert at Playbill as well as how you can obtain tickets. According to Enterprise News, four teens from Brockton, MA who overcame hardships and bullying in school by dancing will be performing on Dancing With The Stars November 15th in AT&T’s Spotlight performance. Below are some details…. BROCKTON — When twin brothers David and Jacob Guzman of Brockton started dance class at a young age, it was to stop them from causing trouble while their sister was in the studio. But during 14 years in the Gold School Dance Art studio, the boys found their niche in dancing, long after their sister was gone from the program. Now, their talent has been recognized by a national television program. The Guzman twins, both 16; along with Kyle Scanlan, 17, and Matthew Gilmore, 15, will be performing live on ABC’s hit show, “Dancing with the Stars,” at 9 p.m. on Nov. 15. The piece is part of an AT&T Spotlight portion of the program. The brothers are juniors at Brockton High School; Scanlan is a senior. Gilmore lives in Canton. The four boys and their family members will be flying out to Los Angeles on Nov. 12. “Being around L.A. and Hollywood, the boys are always going to remember this,” said Richard Guzman, the twins’ father and a math teacher at Brockton High School. The brothers’ mother, Karen Guzman, agreed. Rhee Gold, owner of the Gold School Dance of Brockton, made a YouTube series of dance videos featuring the four teens entitled “Male Voices.” The series includes six episodes, which included hip hop, ballet, contemporary jazz, and tap dancing. “Male Voices” was recorded two years ago. Gold pitched it to ABC about one year ago, and a producer from the show viewed the videos and invited the boys to appear on the program. “The episodes all talk about bullying, and how other kids would make fun of us for dancing,” David Guzman said. You can read more on them here. Be sure to watch this “Male Voices” video which will give even further information and insight for why the producers picked them to dance. Too cool!! Also, the winner for the Design A Dance Costume has been picked. Her name is Amanda Wolff. You can read all about the 22 year old at ABC Philadelphia. We’ll get to see what she created in the “Design A Dance” performance on November 15th. Below is a take of how excited she is…. She is understandably ecstatic about the win. Mark Ballas has written a new blog for what he thinks of the top five couples left on Dancing With The Stars for USA Today. He goes through their strong points for why they have made it this far which you can read about below. Be sure to read the full blog at the link for he also has some special words for David Arquette. He’s looking forward to the finals and dancing with Kristin Cavallari again. It this point it is clear that Ricki (Lake) and Derek (Hough) make a great couple. Ricki has really proven herself over the course of the season. Not only is Ricki a good dancer but she also plays the characters well each week and that’s what it takes to seal the deal. She even is dancing through a rib injury right now but still remains at the top of the leaderboard. I expect she’ll stay there throughout the rest of the show and will make it into the finals. J.R. (Martinez), according to Len, had a “substandard” week. Yes, he made a few mistakes but it only makes the man human. If you have learned anything about J.R. from the show, you know that he is a fighter and will come back this week with a strong and on-point routine. Some of J.R.’s strengths are his speed and ability to be light on his feet. These two characteristics are extremely important when it comes to ballroom dancing. Hope (Solo) is back! She performed one of her best dances last week and I can’t wait to see what she has in store. Many of the athletes on the show have done a tremendous job of transforming into dancers. Some of the great qualities about Hope are that she has tremendous speed and endurance. This allows her to perform well on show days and can help her stay focused during the long rehearsal hours. At this point, everyone is exhausted which translates into mental challenges. Professional athletes know how to push themselves and Hope is no different. This will continue to help her throughout the remainder of the show. Nancy (Grace) keeps on improving week after week and as she said Tuesday night, “it’s not over until it’s over.” I think she has been overlooked this season but she is right, until she’s eliminated, she also has a good shot at winning the mirror ball trophy. Len loves when routines stay traditional and her partner Tristan (MacManus) has done a really good job of choreographing the routines that way. She has become very precise in her dance routines and that is a big reason in how she has made it this far. Rob’s (Kardashian) biggest strength is that he is a quick learner. This is crucial during the long season of Dancing with the Stars. If a celebrity can catch on fast, it allows for more time in rehearsal for fine-tuning the routine. Rob has been very consistent all season and I believe that this consistency will carry him into the finals. He has a lot to bring to the dance floor and his dedication will show in the next couple of weeks. Picture above is from Mark’s facebook of he, Derek, Cheryl, and Kym after one of the shows this past week. How did I miss this interview this morning? This week is starting to catch up with me. I’m relieved it’s over and it’s the weekend. 🙂 Anyway, don’t miss Nancy and Tristan on Good Morning America talking about the ‘scary’ instant Jive and the Tango. Nancy says she’s lost 23 pounds since she started dancing. It’s all because Tristan ‘won’t give her a break’. LOL More below. You’ll also be able to see her and Tristan talking about dancing tonight on her show with Lacey Schwimmer, Sasha Farber, Chaz Bono, Holly Madison, Melissa Joan Hart, and Monique Coleman. Be sure to tune in on the HNL channel at various times tonight. Check your local TV scheduling for times.